12th of May is Jerusalem day! Got to finish work early today, although the parades of anniversary of the reunification of Jerusalem from 1967 start at 5pm, we were told we could leave at 3pm because buses would either cease running or traffic would just make things impossible to get home. After a quick visit to the market and then read sit in a coffee shop for 45 minutes or so reading my National Geographic magazine that arrived a couple of days ago, I got to just relax for a while then head off on the bike to see what celebratory activities would be happening. When I got to King George Street there are thousands of people everywhere and the police have cordoned off the roads to let people gather all over the main roads of the city centre. I stuck around for 10 minutes and didn’t see much apart from people with flags and banners so I decided to head off home and get some dinner. Here as you can see the Magon David ambulance service are here ready in case of any urgent need. 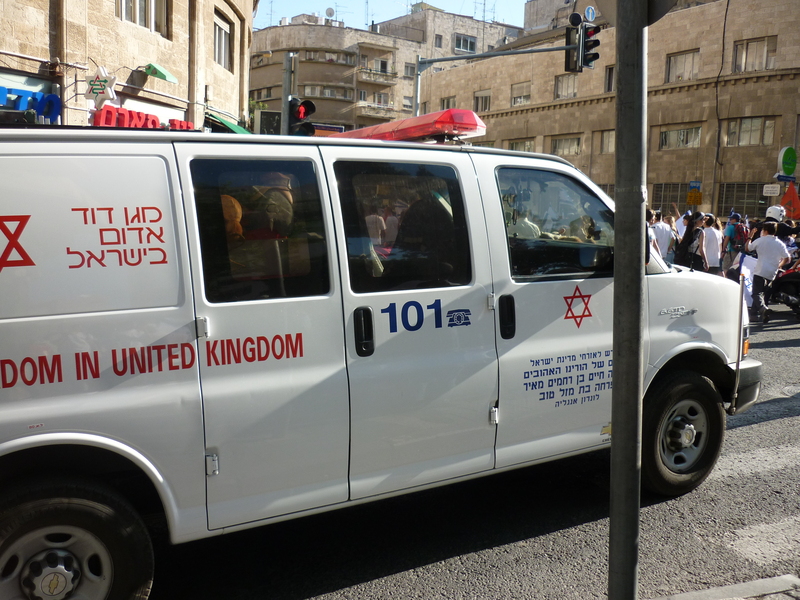 This organisation always has the sponsors written on the vehicle, most of them time its from a Jewish philanthropic group in the US, sometimes Canada, but sometimes they are paid for by French or British Jewish people. I am not sure if its because the government cannot stretch to pay for this kind of essential service, I think its more to do there is always a regular source of funds available from generous Jews in the diaspora wanting to provide medical help in times of need. Its funny that these ambulances are always American vehicles, this one being a GM Savanna or they may be Ford F150s, which in this particular van has a 6 litre engine, which does seem enormous compared to European or Japanese made commercial vehicles, as you often see regular 2.5L diesel British made Ford Transit vans for regular businesses used in Israel. I have an Arab friend who is training to work for Magon David at the moment. It would be interesting to know if wealthy Arabs in places like Saudi, Qatar or Kuwait fund ambulances in Palestinian towns like Ramallah, Nabulus or Hebron.